It’s August already, and you prepare for the upcoming school year? To facilitate your study life, you’re supposed to update your school supplies list. WonderFox is your one-stop destination for all of your 2014 Back to School multimedia software needs! We painstakingly selected the top must-haves 2014 Back to School supplies for you. This “Back to School” program will last through 15, September. 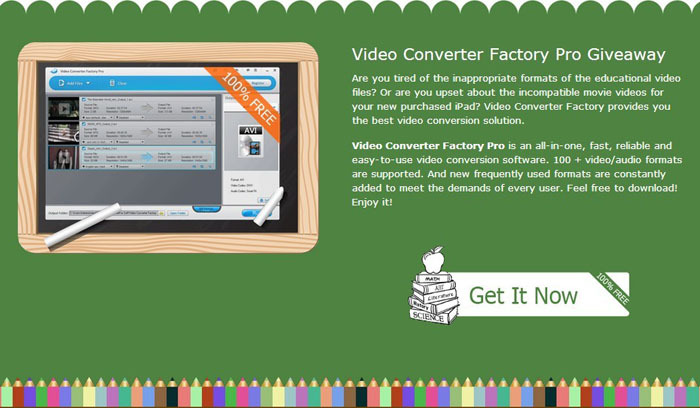 To welcome the school season, WonderFox makes its competitive product, Video Converter Factory Pro (list price $29.95), as a special gift in return for students. VCF Pro makes light work of transferring the educational video files into any portable device. During the function, everyone is permitted to download the software and get the free license code by visiting the active page of Video Converter Factory Pro Giveaway. Single-click “Get it Now” button, after this you can access download area immediately. The zip file includes installation package and free license. 1. Fast email-respond service within 1~8 hours. 2. Life-time free update and support. 3. Retrieving your lost registration code without any cost. WonderFox Soft, Inc. (www.videoconverterfactory.com) established in 2009, is a software company specialized in multimedia software solutions including video/audio converting and editing programs. Due to superior quality and service, we have nearly 3,000,000 clients all around the world. It's now or never, so make up your mind to join in WonderFox Back to School Sales. It will bring you the best school year ever.